It’s been birthdays-a-plenty around here lately. Or, I guess the reality is that having kids that are now old enough to hang out with other kids means that we have kid parties to attend. In Eve’s case, we had a party we planned to attend but had to un-RSVP because of the snots. I hate the snots. Birthday parties and snots. They don’t go well together. 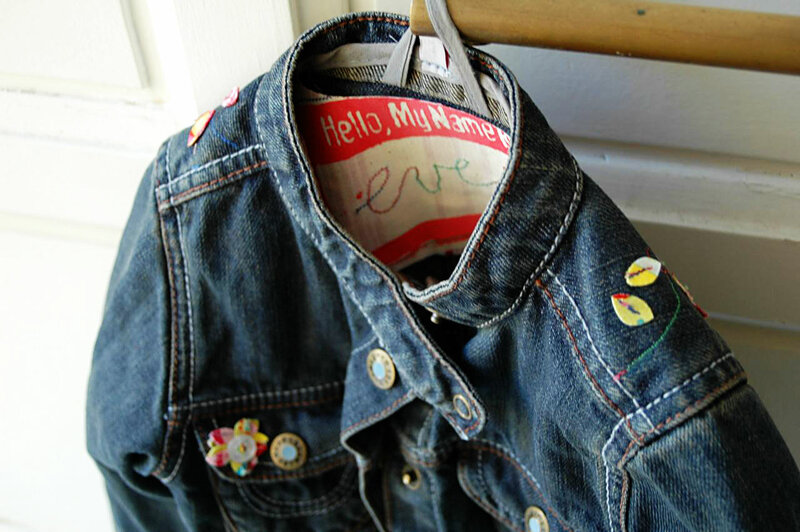 Long before the invite to the playgroup that was to celebrate the third birthday of Eve, I found a cool jean jacket that screamed out “Hey! Make me the coolest kid around!” And, really, how could I refuse? I had recently seen this. 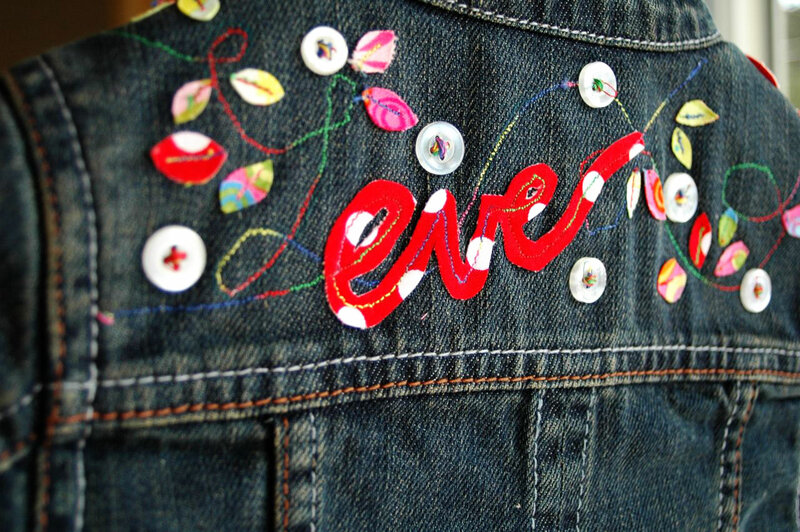 I love all of the hand embroidery. My machine and I knew we weren’t up to that level of amazingness, but we could do something fun our own way. I wrote about using double-fused fabric here. It’s fun to trim and work with. I started with Eve’s name in cursive on the back. I drew the letters with a water-soluble marker on the right side of the fabric. Then I followed the line, trimming with scissors so that there was an even border on each side of my line. After that shape was trimmed out, I placed it where I wanted it on the jacket. 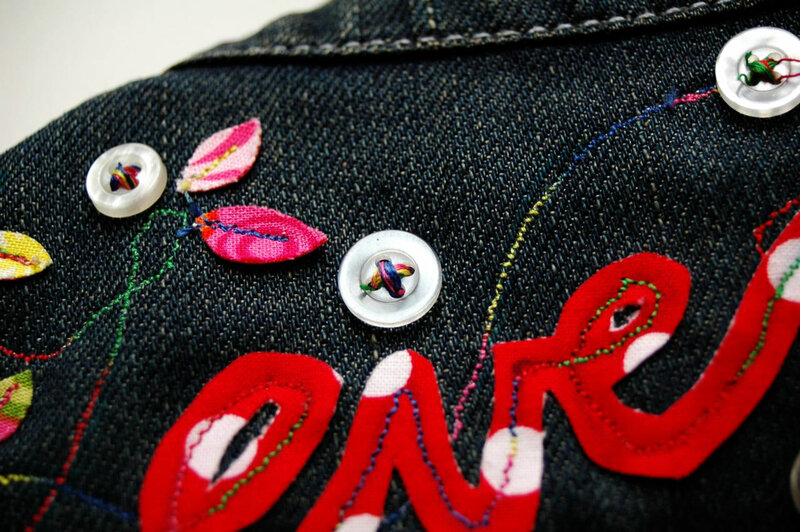 I didn’t even pin it, because the presser foot held the double-fused fabric against the denim fairly solidly. I stitched right over the line I had drawn, using a decorative stitch set to a narrow width and a colorful variegated thread. I cut more of these leaves. Then I started stitching leaves on in a vine-like pattern. Again, no pinning required, just nudging them under the presser foot where I wanted them as I went. I used a regular presser foot with the feed dogs operating as feed dogs do. The only machine-related note I have here is that you need to go slowly with steady, slow, controlled speed. I had a basic sewing machine that did not have any form of speed control and that machine wouldn’t have worked for this. Spasms don’t work so well with crafting. At about this time last year I got a new machine that wasn’t a whole lot more fancypants except for the speed control. After I placed the vines where I wanted them and spritzed the water-soluble marker lines with water to get rid of them, I used Disney’s super-amazing button technique to add small white pearly buttons. Bling that isn’t crazy bling-y. I wanted to add something simple to the front, so I stitched through one of the leaves, then kept feeding them through in a long chain without snipping threads in-between. 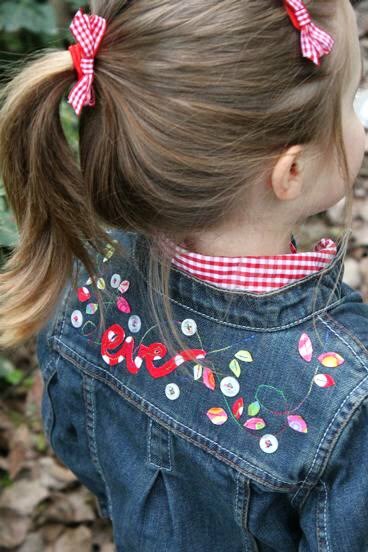 When I had stitched through about 12 of them, I turned them into a flower shape and stitched a button into the midde. 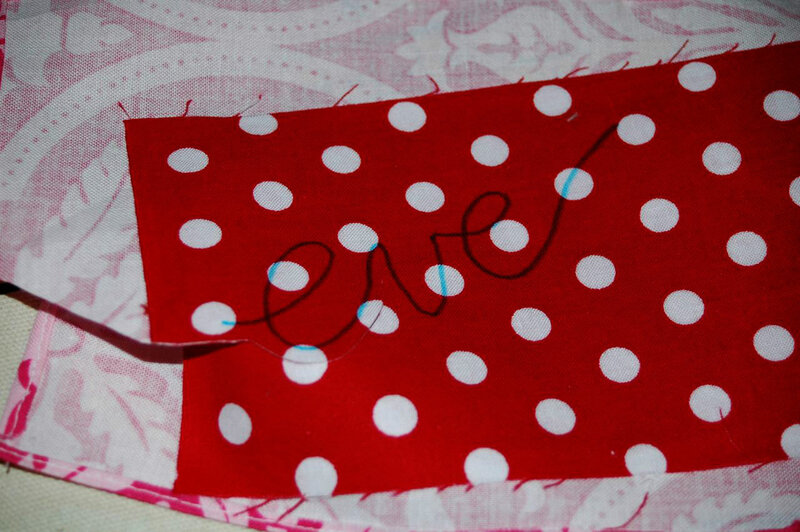 Then just a few stitches to attach that to a front pocket flap. 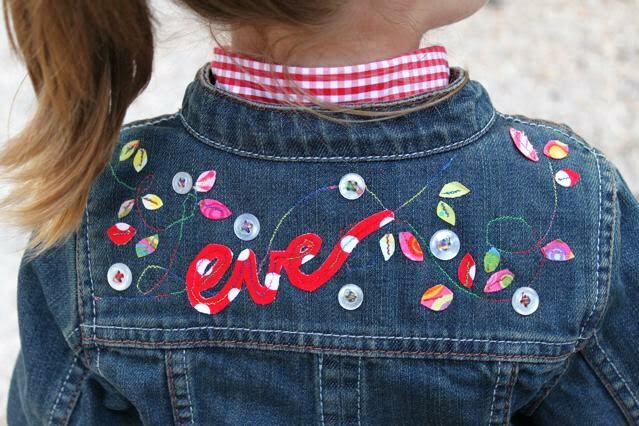 Since I wasn’t sure that everyone and their brother would know Eve’s name and the fact that this jacket belongs to her by looking at the back of the jacket, I used one of my “Hello My Name Is” screen-printed appliques inside the jacket. Just in case someone picks up the jacket and says “who does this belong to?” Since the bobbin thread of the stitching was all uuuugly in there, I trimmed out a piece of striped fabric to fit, ironed on some fusible interfacing and covered up all the ugly with some stripe-y pretty. And the name label. And the best part, as always, is seeing a kid willingly put on something you’ve made. 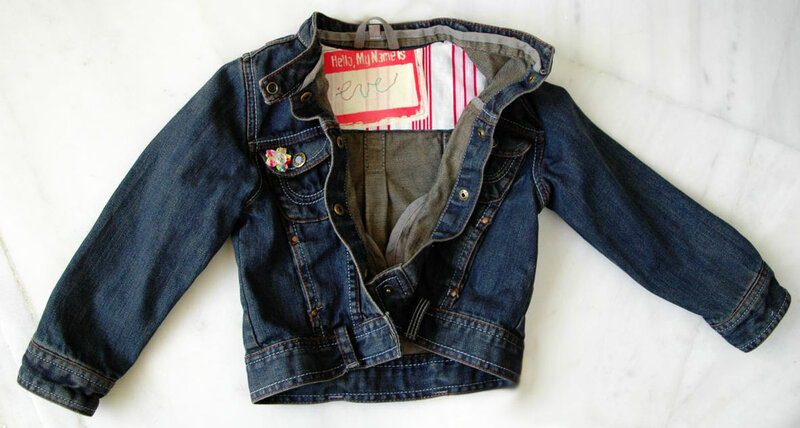 As much as I love the jacket and as cute as I think it is, Eve is totally cuter. 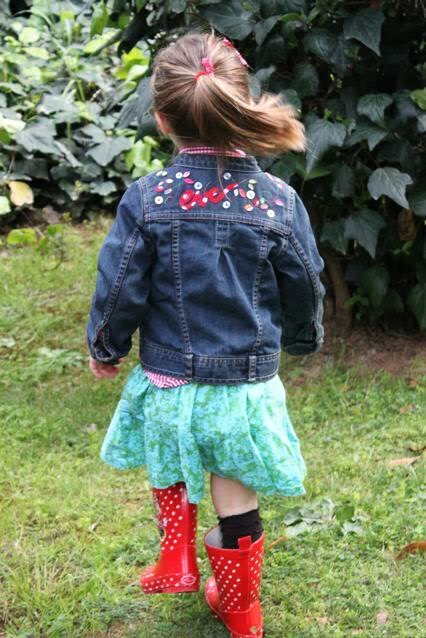 (And if I hadn’t told you her mom has style, you’d know it anyway from how she accessorized the jacket!) Sorry about missing the party because of the snots, Eve. Glad the jacket is finally in your cute little hands. « Blog Swapping with Mary Janes and Galoshes! So great! I’m sure Eve and Kim just love the jacket. I want one too. 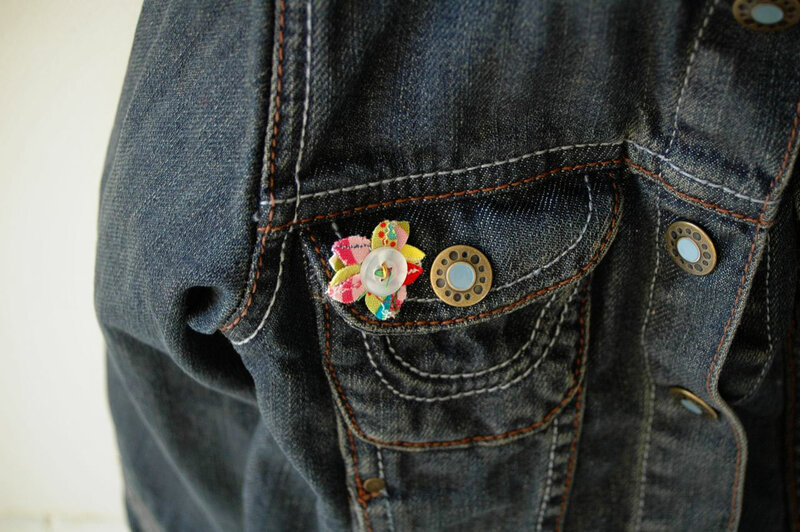 I especially like the little flower button on the front. Beautiful! Love, love, love it! Eve is getting so many compliments wearing it here in Holland. Thanks again for this amazingly creative awesome gift! Totally adorable. And such a great tutorial, I may have to try this. Thanks! What a great job – looks so cute! reason 4192 on why i should have had a girl…great post! it’s gorgeous. my only concern is strangers knowing the child’s name and calling to her while parents aren’t looking. . .and taking her away. Sorry but I’m terribly frightened of that. Is it bad that I want one now? For me!